I’ve known friends and fellow wedding photographers Rob and Sarah for many years. 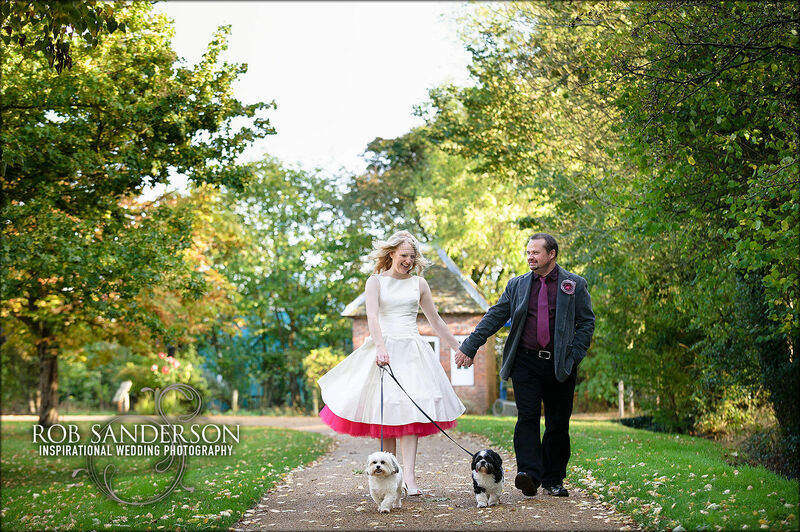 Rob and Sarah are highly respected in the wedding photography industry so it was a real honour to be asked to photograph their wedding at Avoncroft Museum. After the fun of their engagement shoot I was really looking forward to shooting their unique wedding at this equally unique venue. Like me, Rob and Sarah see many wedding each year they wanted something totally different. So they themed their day around their excellent ‘the Who’ tribute band, from Sarah’s knee length dress with cerise trim to Rob’s 60’s styled outfit and the mods target styled button holes. This was also the first wedding with the bride and groom’s dogs actually at the ceremony (had to watch I didn’t fall over them). It all started the night before where I went out for a meal and a few quiet ones with Rob and the gang whilst Lou spent the evening with Sarah and the girls. I got Sarahs in the morning and after having a quick chat set to work capturing her bridal preparations. It was obvious I was shooting a photographers wedding as its one of the tidiest rooms (along with my sister in laws last year) I’ve seen a bride get ready in. Sarah’s dress was awesome, so striking with its cerise net trim. Once Sarah was in her dress I made my way to Avoncroft Museum to catch up with Rob and introduce myself to the ‘notorious’ registrars they have in this part of the country. Sarah arrived at Avoncroft Museum in style in a classic, white convertible VW Beetle in matching big 1960’s shades. The room where the service was conducted, although tough had an amazing ambience, I love the way this shines out in the photographs. The registrars were great on the day and a far cry from their reputation and indeed the last time had to work with them. Rob and Sarah had arranged for a guided tour of Avoncroft Museum while we took some fashion portraits, but still had time to catch up with the end of the tour, its a fascinating place! The whole day was just fabulous and I even got to stay late and Party with Louise once my photography duty was done! They even managed a spot of dog walking with Pippa and Bella. Rob surprises Sarah and all the quests with a guest slot on bass guitar! Rock ‘n’ Roll! He rocked it, literally! I love that the bands official bass player clapped along with Sarah and everyone else. Then Rob switched to lead inflatable-guitar with real attitude! Continuing their tradition breaking they had the last dance of the evening and confetti too. Thank you Rob for doing such a fantastic job and capturing some amazing photos. It was a pleasure having both you and Louise being a big part of our day. An amazing wedding but I must say that the final shot by the windmill is just to die for! Congratulations to the happy couple! Completely stunning work as always, Rob. I LOVE Sarah’s outfit, and Rob looks very cool too. That first shot is my favourite! Brilliant set of two fantastic people. Congrats to you both. Fantastic set of pictures Rob. Especially the first shot, killer stuff. Looks like everyone had a lot of fun. Sarah looks amazing, and Rob brushes up well too. Awesome work, Rob! Great light and great moments as usual! Let’s face it, with this many critical eyes on this one, it had to be a doozy but I don’t think anyone would argue that you’ve done a remarkable job Rob. If we was getting married again, you’d be top of our list. ;) Rob & Sarah – you both look amazing!